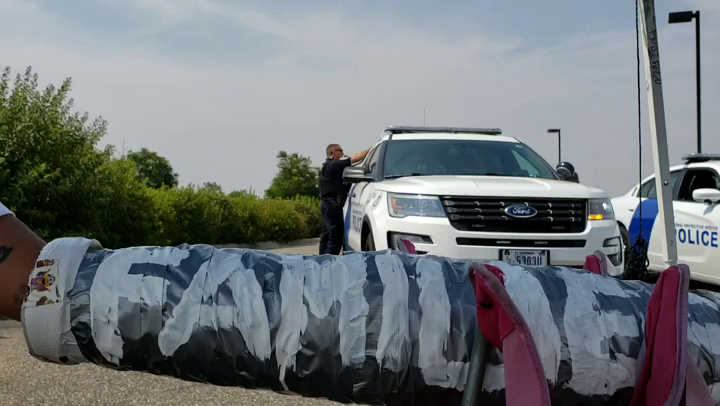 Officers give a warning over loudspeaker the afternoon of Aug. 2 at a protest at the Denver-area U.S. Immigration and Customs Enforcement (ICE) office in Centennial. In the shot, material used to link some protesters' arms in a blockade of the entrances to the building's parking lot is visible. The material reads, "Families belong together." Hanna Khavafipour, a 29-year-old protester from Denver, initially refuses to move at the U.S. Immigration and Customs Enforcement (ICE) Denver Field Office at 12445 E. Caley Ave. in Centennial Aug. 2. Deputies and SWAT personnel from the Arapahoe County Sheriff’s Office walked the crowd away from some protesters who formed blockades at entrances to the parking lot. Arapahoe County Sheriff’s deputies and SWAT officers separating a line of four protesters who used material to link their arms and block one of the exits to the parking lot at the U.S. Immigration and Customs Enforcement (ICE) Denver Field Office in Centennial on Aug. 2. Another line of four linked protesters blocked a second exit to the lot. Officers used a tool to remove what a protester described as like “PVC pipe” material, placing sheets over protesters in the process. Deputies and SWAT personnel from the Arapahoe County Sheriff’s Office line up on East Caley Avenue in front of the U.S. Immigration and Customs Enforcement (ICE) Denver Field Office Aug. 2. Protesters formed blockades at entrances to the parking lot. Officers in the background carry what appeared to be tools to remove material that linked protesters’ arms who blocked entrances to the parking lot at the U.S. Immigration and Customs Enforcement (ICE) Denver Field Office Aug. 2. About 80 law-enforcement officers total, including Arapahoe County and Department of Homeland Security personnel, were on scene. In the distance, on the hill, people gathered to watch the scene at the U.S. Immigration and Customs Enforcement (ICE) Denver Field Office Aug. 2. Protesters blocked entrances at the parking lot. One of the protesters who blocked entrances at the parking lot at the U.S. Immigration and Customs Enforcement (ICE) Denver Field Office Aug. 2 in Centennial. The protester’s shirt reads, “Abolish ICE.” Protesters were covered by sheets as officers removed the material that linked their arms. A law-enforcement official on the roof at the U.S. Immigration and Customs Enforcement (ICE) Denver Field Office Aug. 2. Another official was on the roof at the building across the street amid a protest at the ICE office. Protesters with arms linked by what one protester, not pictured, called material akin to “PVC pipe” blocking an entrance to the parking lot at the U.S. Immigration and Customs Enforcement (ICE) Denver Field Office Aug. 2. The scene drew more than 70 law-enforcement officers, including federal police with the Department of Homeland Security. Officers in tactical gear in front of the U.S. Immigration and Customs Enforcement (ICE) Denver Field Office Aug. 2. Police with the Department of Homeland Security were on scene. Protesters formed blockades at entrances to the parking lot. A sign at the protest in front of the U.S. Immigration and Customs Enforcement (ICE) Denver Field Office Aug. 2. Protesters formed blockades at entrances to the parking lot. Signs that spell “Abolish ICE” and one reading “No human is illegal” in front of the U.S. Immigration and Customs Enforcement (ICE) Denver Field Office Aug. 2. Protesters formed blockades at entrances to the parking lot. Four of the protesters who used material to link their arms and block an exit from the parking lot at the U.S. Immigration and Customs Enforcement (ICE) Denver Field Office at 12445 E. Caley Ave. in Centennial Aug. 2. The four had their bonds cut with a tool by officers, who then detained them. This story has been updated to reflect law enforcement's clarification that protesters were detained and given federal citations, but only one was arrested. Protesters stood vastly outnumbered by local deputies, SWAT and federal police in front of the local office of U.S. Immigration and Customs Enforcement in Centennial Aug. 2, yelling messages on a megaphone, singing songs and in some cases getting in officers' unmoving faces as they blocked the ICE parking lot. The crowd protested the separation of children from migrant families at the U.S.-Mexico border in recent months, a federal practice that was later reversed, though hundreds of children remain separated from parents who were deported while their children were detained. Eight protesters who used material to bond their arms in a blockade of two entrances to the parking lot were detained by Arapahoe County Sheriff's Office deputies and federal police. Seven received federal citations and were released at the scene, according to Julie Brooks, spokeswoman for the sheriff's office. One was arrested after refusing to provide identification, Brooks said. That protester was taken to the Arapahoe County jail and was to be transported to a U.S. marshal's office, she added. All eight protesters were released, a spokeswoman with the protest said noon Aug. 3 in a news release. The protest, organized in part by longtime activist and undocumented immigrant Jeanette Vizguerra, arrived in front of the Denver Field Office at 12445 E. Caley Ave. in Centennial the evening of July 29 and was planned to last a week, Vizguerra said. About 15 people slept at the encampment on the first night, she said. On Aug. 1, before the parking-lot entrances were blocked, ICE commented on the protest. Rusnok declined to offer comments on the Aug. 2 scene at the protest. The Denver Field Office's area of responsibility includes Colorado and Wyoming. More than three dozen protesters stood on the sidewalk and street in front of the office late afternoon Aug. 2, chanting in Spanish and English as federal police voiced legal warnings against the parking-lot blockades on loudspeaker. By about 5 p.m., roughly 80 law-enforcement officers total, including Arapahoe County and federal police with the Department of Homeland Security, were on the scene, where two groups of four protesters blocked entrances to the lot. Dozens of deputies and SWAT personnel from the sheriff's office — both in riot helmets and vests — formed a semi-rectangular line around one of the groups of four. Officers lined up across the width of East Caley Avenue and walked forward as protesters backed up, with one protester who initially refused to move — 29-year-old Hanna Khavafipour — being pushed back by an officer. One of the protesters later detained reportedly sustained a minor injury that was treated at the scene, Brooks said. No protesters aside from those in the blockades were detained, cited or arrested, Brooks said. Protesters stood amid signs opposed to President Donald Trump's administration's practice — later reversed — that resulted in separation of children from parents on a wide scale at the U.S.-Mexico border in the detention process for migrants. About 150 protesters were in the crowd in the morning and early afternoon, said Jenn Piper, who identified herself as a "press liaison" for the protest. By mid-afternoon, the number of protesters dwindled to about 40. That morning, protesters marched in a circle near the parking-lot entrances, Piper said. The arm-link blockades began around 11 a.m., and Homeland Security police arrived about an hour before that, Piper said. Multiple times in the afternoon, federal police read legal warnings on a loudspeaker, including that "federal fines and/or arrests can occur" for blocking entry or exit to the parking area. At 4 p.m., federal police handed out legal notices to protesters that said those who obstruct parking lots will be subject to arrest. A 10-minute warning to disperse at about 4:20 p.m. came and went, and after the police presence grew, officers used a tool to remove the material bonding the protesters in the blockades, which Piper said was similar to "PVC pipe." All the while, a handful of protesters approached and yelled at officers who lined up in front of the bonded protesters, asking questions like, "Are you on the right side of history?" and how they would feel "if they were your children" separated at the border. Other words by protesters included saying officers were supporting white supremacy and imploring them to quit their jobs. One protester yelled messages at the stone-faced officers including, "I know some of you go to church" and "What would Jesus do?" Protesters are "putting their freedom on the line for something bigger than themselves," said Tommy, a protester from Aurora who spoke on condition of being identified by first name. Piper, the protest spokesperson, said the arm-link blockades were planned by Abolish ICE Denver when protesters felt that the July 26 deadline for the federal government to reunite families and children separated at the border would not be met. "The concern of folks here is that the kids (not yet reunited with families) will end up in foster care," Piper said. Vizguerra, one of the organizers of the protest, stood among the crowd during the heavy police presence. “It's not 'immigration is my problem' — it's everybody's problem,” Vizguerra said at the protest July 31. Vizguerra was named one of TIME magazine's 100 most influential people of 2017 and garnered widespread media attention amid an 86-day stay in church sanctuary from immigration enforcement in Denver that year.